Lithuanian Christians anticipate Pope Francis’ visit in September while celebrating their country’s 100th anniversary of independence. 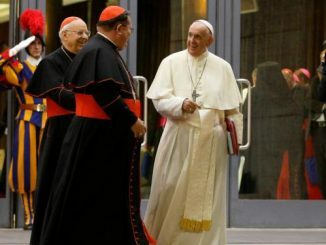 “A call to look toward the future and to preserve the flame of freedom in our hearts today,” is how Archbishop Gintaras Grusas of Vilnius, Lithuania describes Pope Francis’ upcoming visit to that country in September. Archbishop Grusas recently spoke to CWR about the powerful history of the Lithuanian Church, as well as his personal journey of faith and vocation. CWR: Archbishop, you were born in the United States, in Washington, in 1961. Can you tell us something about your origins and your family? Archbishop Gintaras Grusas: My parents were separated during the Second World War. My mother and my sister remained in Vilnius, while my father, who had been taken to dig trenches on the front, managed to escape into Germany. He spent the rest of the war in the displaced persons camps. After the war, not being able to return to Lithuania because of the Iron Curtain, my father was able to emigrate to the United States, where he finished a master’s degree in mathematics and later began to work for IBM. But because of the war and the subsequent occupation, the family had lost complete contact and for 12 years neither my father nor my mother and sister knew if the others had survived the war or not. Through friends of friends of friends, they found out that everybody was alive and my father began to try to get my mother and my sister out of the Soviet Union. After various attempts, my father managed to get their names on a list of separated families of the State Department. When Vice President [Richard] Nixon met with Khrushchev in 1959, part of that meeting was a goodwill gesture allowing 200 separated families from throughout the Soviet Union to reunite. My mother and my sister came to the United States in 1960 and I was born in 1961. In that sense Lithuanian was truly my mother tongue, as my mother did not speak English when I was born. CWR: The Episcopal See of Vilnius remained vacant for 34 years, between the death of Archbishop Romuald Jałbrzykowski in 1955 and the appointment of Archbishop Julijonas Steponavicius in 1989. During the years of the communist dictatorship, when Lithuania was incorporated into the Soviet Union, what happened to the Catholic Church in Lithuania? Archbishop Grusas: It is true, that the See of the Bishop of Vilnius did not have its own bishop for some time. 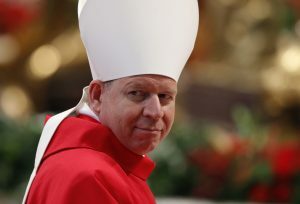 Bishop Julijonas Steponavicius was forced into internal exile for 25 years, yet the appointed administrators of the diocese respected the Church hierarchy and clandestinely did coordinate major actions within the diocese with the bishop, who was impeded by the government from carrying out his proper duties. There were many other bishops and priests, who gave their lives for the Church or were subjected to exile and the labor camps in Siberia. Among them, Blessed Archbishop Teofilius Matulionis, who was beatified last year, and various others whose cases are still in progress, such as Bishops Mečislovas Reinys, Pranciškus Ramanauskas, and Vincentas Borisevičius, as well as many other priests, religious and lay Catholics. CWR: How was the Church able to survive? Archbishop Grusas: A significant aspect of the Church during this period was the clandestine resistance that was in fact the preserved flame which burst into the fire of freedom during the independence movement in the late 1980s. The beginnings can be traced to the publishing of the underground “Chronicle of the Catholic Church in Lithuania” beginning in 1972, which documented the persecution of the Church in a society that externally claimed a freedom of religion in society, while actually having an extensive apparatus of persecution. The Soviet system was unable to stop this group, as [whenever they] arrested one member, someone else would come in and take his place. Of the collaborators in this movement, three later became bishops after independence was established, and all three are currently emeritus bishops. The underground Church included not only these publications but clandestine seminaries and religious orders, clandestine preparation for the sacraments, and missionary work throughout the Soviet Union. The faith was preserved not only through such organized resistance, but most of all through the perseverance of passing the faith down within the family. Grandparents had their grandchildren baptized secretly, so that it would not affect the employment of their children. CWR: Pope Francis, as part of his European travels, has so far chosen destinations considered smaller and peripheral. Do Lithuanians feel as though you are somewhat on Europe’s “peripheries”? Archbishop Grusas: There are no peripheries for God—all his children are central to his heart. It is society that creates those divisions—First, Second, and Third World, as well as divisions within our local societies. Having leapfrogged from a technological perspective since the re-establishment of independence 25 years ago—for example, [Lithuania has] one of the fastest Internet speeds in Europe—there is also the sense of [Lithuanians] having survived a great trial, which keeps us from feeling part of the periphery in a psychological sense. From a geopolitical and economic point of view, we are certainly not principle players on the international scene. We are on the eastern border of the EU and that does cause some concern. One does not forget the cost of self-preservation. Although economic development has progressed significantly, there are great disparities in economic equality, for example the average wage [in Lithuania] is significantly below the EU average, although the cost of goods is on par with many other places in Europe. This causes tension within society and leads to other problems, such as a very large emigration. In the last 25 years, the population of Lithuania has decreased almost 25 percent. CWR: The last trip of a pope to the Baltic countries was in 1993. In these 25 years, your country has undergone significant changes. The arrival of Pope St. John Paul II in your lands meant newfound freedom—what of the arrival of Pope Francis today? Archbishop Grusas: Twenty-five years ago, with the arrival of John Paul II, the Lithuanian people were full of hope about the future. 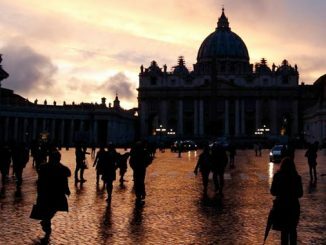 Freedom, responsibility, and solidarity—all things that John Paul II talked about during his visit—were foreshadowings of the challenges that were awaiting us in the future, as the country was embarking on its journey of living and growing in a free society. After years of occupation, these first steps, although challenging, were full of hope. Yet these 25 years have shown that to live in freedom has just as many challenges as the prior period. For many the hope of the new independence has turned to disillusion. “Is this the type of independence that we struggled for?” many ask themselves. The just and free society that was dreamed of has its shortcomings and many have landed in financial hardships or sense a lack of control of their destiny. Having lost a sense of the hope they had once experienced, re-establishing such hope is a great challenge. Here the message and theme of the visit to Lithuania, “Christ Jesus—Our Hope,” is key for people to face their future again with hope. 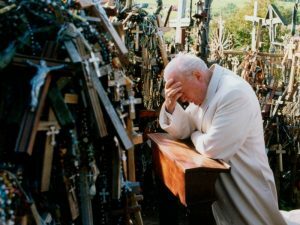 CWR: One of the most indelible images from Pope John Paul II’s visit to Lithuania is from his visit to the Hill of Crosses, a place commemorating the martyrs of Lithuanian Christianity in the 20th century. What does that place mean for Lithuanians today? 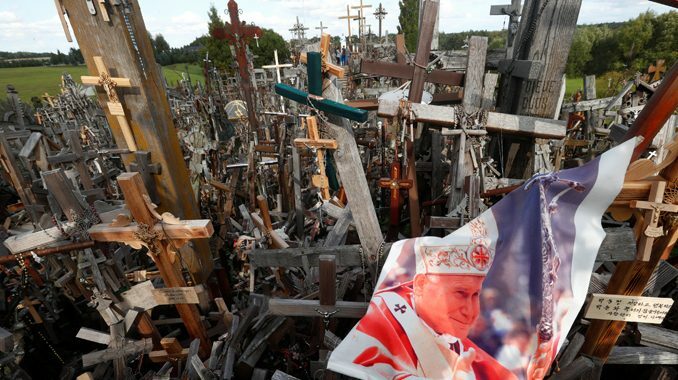 Archbishop Grusas: For many Lithuanians the Hill of Crosses is strongly associated with the visit of Pope John Paul II. It was not only the image of the Hill of the Crosses that the world saw, but the way that the Holy Father joined his prayers to ours, how he took to heart all the suffering that we had suffered, reminding us that the Church always suffers together with the sufferings of her children, wherever they might be. For Lithuanians, it is not so much an open-air museum, but a living space, where we go not only to remember the past, but to entrust our present and our future into God’s hands, as well as to give thanks for graces received. People bring crosses to symbolize the entrusting of their daily crosses into God’s hands. The crosses are like votive offerings representing graces received. They are a symbol, representing today as in the past, that as the people plant their crosses on the hill, they also witness that their hope is Jesus Christ. CWR: The visit of Pope Francis also coincides with the centenary of the birth of the State of Lithuania in 1918. What is the significance of this coincidence between the Pope’s visit and this anniversary? Archbishop Grusas: The Centenary of Independence has a double significance. One is looking back, thanking God for the gift of freedom, for those who gave their lives and suffered for freedom, both in the early years of national independence, as well as during the many years of occupation during which such a great price was paid to preserve the hope of freedom. It is also a call to look toward the future, to preserve the flame of freedom in our hearts today; to understand the deeper meaning of freedom, not only a freedom from oppression, but also a freedom to find one’s vocation and to serve God and one’s neighbor. This is especially true for our young people, who must see what different types of things limit their freedom today, as well as the responsibilities that true freedom gives us. The meeting with young people will be an important event looking towards their future. CWR: Since 2004, Lithuania has been part of the European Union, which is going through a difficult period. Many see a Europe marked by fear, attempting to close in on itself, between resurgent nationalism and waves of populism. For Lithuania, what does it mean to be part of Europe? Archbishop Grusas: First of all, being part of the European Union is related to freedom. From the 18th century, Lithuanians have always had to fight for their right to exist. Dangers usually arrived from the East and meant not only the loss of political independence, but often persecution of the Church and the suppression of language and culture. People here have historically had to fight to be who they are—Lithuanians and Catholics. Therefore, to be part of Europe means the right to have one’s identity, to freely practice one’s faith, to have the right to self-determination. 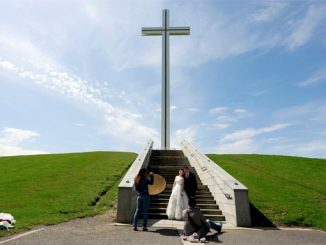 Being on the border between East and West, Lithuanians chose to look to the West, even historically when from the time they accepted Christianity and were baptized into the Latin Church. Lithuanian statehood also goes back to the time that Mindaugas accepted the faith and received the crown from the Pope, thus entering into the family of European nations. Being part of Europe has also been a great assistance in the rebuilding of our national infrastructure, but has put a great deal of pressure on maintaining our traditional cultural, family-oriented values. This participation in the European project requires that we too participate fully and express our own views in the dialogue that gives life to the Union. CWR: The war in Ukraine has exacerbated the relations—which in some cases were already uneasy—between Russia and neighboring countries which, like Lithuania, were part of the Soviet Union. In the Baltic countries that the Pope will visit, there is also the issue of Russian ethnic minorities. 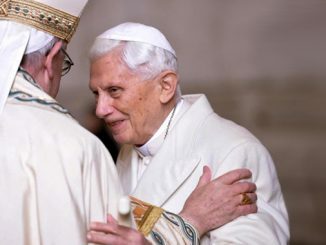 Do you think the Pope’s trip contribute to easing these tensions? Archbishop Grusas: The first thing to be noted is that the issue of the Russian minority is part of a very large propaganda campaign (or, in today’s terminology, a “fake news” campaign) emanating from Russia itself, similarly to what has been used in the past to prepare a justification for its illegal actions, such as we have seen in Georgia and the Ukraine. Secondly, one needs to distinguish between the three Baltic republics, where the situation of minorities is quite different. Latvia has a 27 percent ethnic Russian minority, Estonia 24 percent, while the Russian ethnic minority in Lithuania is only 6 percent (according to 2014 data). The tensions that arise are much less on an ethnic basis … [then they are] general tensions caused by the demographic and social situation in the countries. An underlying problem is a weakness in the social fabric, where a loss of hope is incited by demographic changes caused by an aging population, as well as large emigration, caused by social inequality and unemployment. This migration also puts great stress upon families and drives people even more towards individualism. The Holy Father’s words and actions are signs of hope wherever he travels. His presence in the Baltic States and the message he brings will be a message of hope in creating a more just and cohesive society for all. The values that the Gospel message proclaims are those that are necessary for building stronger families, and through them a stronger society. Deborah Castellano Lubov is a Vatican & Rome Correspondent for ZENIT, author of 'The Other Francis' (L'Altro Francesco) featuring interviews with those closest to the Pope and featuring preface of Cardinal Parolin (currently out in four languages). She is a contributor to National Catholic Register, UK Catholic Herald, Our Sunday Visitor, Inside the Vatican, and other Catholic news outlets, and collaborator with Euronews, EWTN, and NBC Universal. They will be waiting a long time to get a “deeper meaning of freedom” from Pope Bergoglio whose sermons, speeches, and writings should make it abundantly clear to the article’s “Vatican and Rome correspondent for ZENIT” author, if she had bothered to read them, that his neo-Marxist and socialist “freedom” involves a repudiation of Western market-based capitalism and the embrace of open borders to military-age Muslim jihadists, totalitarian state control of a nation’s economy, and scientifically unverified climate change that prohibits the use of oil, coal, and air conditioning. As a Lithuanian American, I can honestly say that this pope – Francis – will not be a relief to the people of Lithuania. He is a socialist who wants them to go backward into tyranny, not forward into the future with a sound market economy and constitutional democracy and freedom. As someone with Lithuanian heritage, from both sides of the family, I was very interested in this article. While Lithuanians are at 100 % level in literacy and ahead of EU in STEM educational level, as indicated in the article many leave Lithuania for jobs outside the country. Sadder though is that according to one study/statistics is that only 12% of Lithuanians attend church regularly. In effect Lithuania is like the rest of EU in having limited faith. After being under the tyranny of the Soviet system would have thought the data would be better. The article touched on this issue, but did not really get into it, except to recognize it is an issue the Archbishop has to contend with. Wonder why Church attendance is so low when Poland next door appear to have a 33% church attendance rate. As someone who likes to be proud of my Lithuanian heritage, where my family grandparents brought their faith to America, which assured I was instilled with the Catholic faith, this low number is stunning. The Pope and bishops and all clergy need to focus on this, and leave secular issues like climate change to politicians. Having faith and practicing our Catholic faith is the issue.